Every time you use your oven, small particles of food will be removed from your food. They’ll float through the air inside the compartment, and will eventually settle onto the sides. This is why ovens get so dirty, seemingly so quickly. Over time, this layer of grease and grime will build up, getting increasingly burnt-on each time you fire the oven up. Affect the taste of your food. Reduce the efficiency of your oven. Naturally, the best way to prevent these problems is to regularly clean your oven. 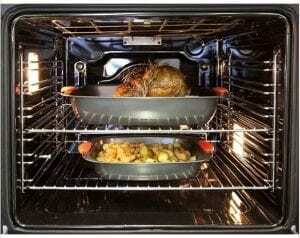 A heavy-duty chemical will eat through the grime that’s caked on the inside of your oven. These are specifically marketed as oven cleaners, and come in spray form. Naturally, they’re incredibly dangerous when ingested. This alone might be enough to dissuade many people from using them in places where food will be prepared. If you want to use a chemical cleaner, give them around twelve hours to lift off the carbon and grease, and then wipe away with a wet sponge. It’s often best to wait overnight. Since these chemicals are very harmful, this option should probably be reserved for occasions where the oven has been severely neglected – they’re unnecessary if you’ve stayed on top of the problem. 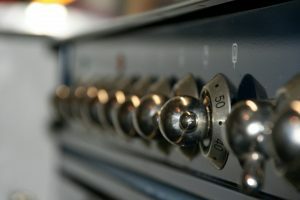 Many modern ovens feature a self-cleaning function. This solution doesn’t involve any chemical cleaners; it instead heats the oven up to a temperature far hotter than it would normally endure – as high as 500°C. This incinerates any caked-on dirt and grime, reducing it to the consistency of fine ash. This can then be easily wiped away. Of course, this process will release a great deal of smoke, especially if you haven’t cleaned the oven for a while, so you’ll need to ensure adequate ventilation. If you’ve got a self-cleaning oven, however, then you really have no excuse to neglect the task – and thus this problem will be minimal. It is possible to clean an oven using entirely natural products, although a little elbow grease will probably be required. Baking soda, water, vinegar and the rinds from citrus fruit are all effective natural oven cleaners. What are the best products for cleaning an oven? So, what should you use when cleaning an oven? There are several solutions – some of them natural, others artificial. Baking soda is often called for. Sprinkle it across the interior of your oven, and add vinegar. Leave it to bubble away for a while before gently scrubbing the dirt off with a damp sponge. It should lift away easily. If you find that the stains are particularly stubborn, you’ll want to use a more abrasive scrubbing implement. Scouring stones and wire brushes can be purchased cheaply, and work well. Be sure to check your oven’s manual before getting to work with one, however, as many ovens come with chemical coatings which might be worn away by such sharp materials. Self-cleaning ovens always come with coatings, so be sure never to use abrasives (or other oven-cleaners) in them. You might wish to make a natural cleaning paste using equal parts baking soda, salt and water. Apply this to the interior of the oven, close the door and turn the temperature up to maximum. After about an hour, the solution will have done its work, and you’ll be able to easily remove the solution (and any grime that it’s helped loosen up). For a more heavy-duty natural cleaner, mix a dash of lemon juice and detergent with a mixture of bleach and warm water. Many will use ammonia for cleaning ovens, by placing a pot of boiling water in an oven alongside a trayful of ammonia, and leaving it to cook at just over boiling point for twelve hours or so. Many leave theirs overnight, but if you’re worried about leaving your oven on while you sleep, do this on a day that you don’t intend to use the oven. Of course, it’s also worth taking steps to prevent your oven from getting dirty in the first place. This might mean laying down a protective layer of aluminium foil before cooking something that could drip; this will ensure that stray droplets of grease don’t have the chance to accumulate on the bottom of the oven. We have a fantastic range of powerful ovens from top, marketing leading brands. Available in a range of sizes and finishes. Buy now! ! If your oven is especially dirty, then you’ll likely be tempted to use a chemical cleaning agent. If they come into contact with your skin or eyes, they can cause severe irritation. You’ll therefore want to take precautions to ensure you’re protected. Be sure to open your kitchen windows as wide as possible, and use a pair of rubber gloves. Keep children and pets well away from the area, and be sure to store your cleaner out of harm’s reach when you’re done. Don’t stick your head in the oven while you’re applying the chemical, as the small compartment will quickly fill with fumes that you don’t want to inhale. How soon can you use an oven after cleaning it? Whichever method you use, you’ll want to be sure to thoroughly rinse the oven after you’ve done, and wipe it dry with a paper towel. Afterwards, you can turn your oven up to 200°C and thereby incinerate any lingering particles of cleaning solution. This takes around ten minutes, and will help to ensure that your cleaner doesn’t leave behind any odours. Next Next post: What is a Fan Oven?